Kentucky-bred colt Havana looked destined for great things in his first race and could be an interesting choice for betting on the Kentucky Derby this May. In August 2012 at Saratoga Race Course in his maiden start, Havana went gate to wire, nearly setting the track record for 5 1/2 furlongs. Havana broke on top under John Velazquez and was never threatened in running fractions of :22.18 and :44.49. He won by 2 3/4 lengths, beating out Kendall’s Boy, who came back to win his next start at Churchill Downs. Havana finished 5 1/2 furlongs in 1:02.64 on a track rated fast. The Saratoga track record at the distance is 1:02.51 by Fastus Cactus on July 25, 2010. For those keeping track for their Kentucky Derby betting strategies, take note that trainer Todd Pletcher got Havana back in action less than two months later, stretching the colt out to a mile for the Grade I Champagne Stakes at Belmont Park. Havana grabbed the lead in the race midway on the far turn and held off a furious late rally from betting favorite Honor Code to win by a neck. Sent off as the 5-2 third betting choice on horse racing odds, Havana returned $7.20 and earned $300,000 for owners Michael Tabor, John Mangier and Derrick Smith, who purchased the horse for $575,000. The gray/roan colt was bred by Harvey Clarke, who also bred 2012 Kentucky Derby winner I’ll Have Another. The Champagne Stakes victory earned Havana a spot in the 1 1/16-mile Breeders’ Cup Juvenile, the richest race in North America for 2-year-olds. Havana went off as the betting favorite in the Juvenile from Post 13 at Santa Anita Park with Gary Stevens up and took the lead as the field passed the final sixteenth pole, up by two lengths. However, New Year’s Day, a 10-1 shot, rallied strongly up the rail from fourth at the top of the stretch and won going away by 1 1/4 lengths, finishing in 1:43. 52. Havana held on for second, three-quarters of a length ahead of Strong Mandate in third. Havana returned $4.60 and $3.40 and stamped himself amongst the top Kentucky Derby contenders. There will be no rematch for Havana at the Kentucky Derby with New Year’s Day as that horse was retired to injury in December. Havana’s sire is Dunkirk, a son of Unbridled’s Song, who won the 1995 Breeders’ Cup Juvenile and 1996 Florida Derby and Wood Memorial. Unbridled’s Song was the Kentucky Derby odds-on favorite that year but finished sixth. Dunkirk is likely best known for finishing second to Summer Bird at the 2009 Belmont Stakes. 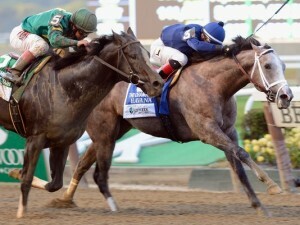 Dunkirk was 11th in that year’s Kentucky Derby, won by Mine That Bird, and second in the 2009 Florida Derby. Havana’s mare is Missy Turtle. Havana closed at 28-1 in the most recent Pool 2 Kentucky Derby odds.